Prices range from $149, $249 and $599 - depending on which version you purchase. Cakewalk say this is DAW 2.0 and their catchphrase is "SONAR has evolved and so can the way you make music". Sonar X3 now come with improved audio engine and a wealth of upgraded and new features. Various bugfixes and stability improvements related to the new X3 release. New effects and instruments including XLN Audio Addictive Drums, Strum Acoustic Session, Nomad Factory Blue Tubes FX, Lounge Lizard SONAR, and much more. Various other bugfixes and enhancements. This update is free for registered SONAR X1 owners with SONAR X1 Expanded (build 425) or SONAR X1c Producer/Studio/Essential (build 319). This update is free for registered SONAR X1 owners. Sonar now remembers the duration of the previous note clicked when the ‘Last Selected’ item is checked in either the HUD (Heads Up Display) or the Control Bar. When the draw duration is set to ‘Last Selected’ the draw duration will be whatever the last note clicked on in the Staff, Piano Roll or Inline Piano Roll views. SONAR now supports 23.976 frames per second on the time ruler. In SONAR X1b it is now possible to apply the ProChannel (Producer only) and the Sonitus:fx EQ (Studio only) to Surround Busses. This addresses a number of issues, including potential crash issues with Sonitus:fx EQ being moved to the FX bin when loading a project saved in SONAR 8.5. It is not possible to access the Surround Bridge UI for the Sonitus:fx EQ or ProChannel when used on Surround Busses. This means that un-linking channels and other Surround Bridge options are not available. Sidechaining is not possible with the surround-bridged ProChannel compressors (Producer only). The first time a control is touched or moved within a given module, it will turn the respective module ON. Any subsequent changes to any control in the same module (other than the enable/disable command) will not enable or disable the module. This command is persisted per-module, per track and per project - once a specific module has auto-enabled once, it will not auto-enable a second time. When freezing a track the ProChannel will now freeze as well. In order to reflect this, the ProChannel will become grayed-out. When the track is un-frozen the ProChannel will be re-enabled. ProChannel support added to the CHANNEL STRIP CONTROL (Producer only). Updated controls in the ACCESS PANEL as well as updated functionality to mirror workflow changes in X1. Addressed other workflow and controls from 8.5 to X1. A new version of the VS-20 control surface plug-in is included with X1b. This update now allows for the DAW OUTPUT control on the VS-20 hardware to control both the left and right faders of the hardware Main Output in SONAR. Fixed a potential crash that could occur when changing time durations of a V-Vocal clip. Fixed a potential crash that could occur when removing a V-Vocal clip. Fixed a potential crash that could occur when adjusting a V-Vocal clip. Addressed an error with looping V-Vocal clips. Included several general stability improvements when working with V-Vocal. Removed drop arrows and overlay icons from controls in Narrow Strips, allowing additional characters to be displayed. Adjusted labels and label positions on various controls. Removed ellipsis from FX bin to allow seeing as much of the FX name as possible. An editable EQ plot has been added to narrow strips for ProChannel (Producer only). Track name and number have been moved to separate rows allowing for longer track names to be displayed. It is now possible to select non-adjacent tracks in the Console View. To do this hold SHIFT or CTRL while clicking on a track strip's Track Number field. It is also now possible to re-order tracks. Hold ALT while dragging a track to change its position. This gesture is available from any open part of a track strip. A "Loop Preview" toggle has been added to the Media menu of the Browser. When enabled, SONAR will preview clips the same as with X1a. When disabled, SONAR will always preview a clip starting from the beginning and will play through a single time, ideal for one-shots. It is now possible to view, preview, and add FLAC files to a project from within the Browser. The hit-zone for docking has been limited to the top section of the MultiDock, limiting the chance for unintentional docking. When the MultiDock is floating, pressing D will now minimize the MultiDock as opposed to re-docking it. Improvements have been made to the way SONAR handles dynamic sample rate changes with ASIO devices. If an ASIO driver supports changing its sample rate dynamically, it will be possible to load SONAR projects at different sample rates. SONAR will automatically switch the device sample rate when playback is started without requiring a restart of the application. CTRL + SHIFT + F12 has been added as the default control to toggle Snap modes between Move-To and Move-By. It is now possible to bind a key to Snap to Measure. Clip lengths are now displayed in Beats:Ticks format. This provides a consistent, accurate length value despite meter changes in a project. XRayExclue.ini has been updated to exclude Nugen Audio. This avoids an issue with Nugen Audio plug-ins by preventing X-Ray from affecting those plug-ins. The Master.ins file has been updated to include support for the Roland JUNO-Gi Synthesizer. Four Project Templates will be installed to the JUNO-Gi subdirectory of the Project Templates folder. A JUNO-Gi Control Surface Preset has been included. You will need an Audio Adapter - see our review of USB Adapters here. Posted by cakewalk is garbage on Thu, 06/13/2013 - 03:16. Oh God, what a sick joke this software is. Posted by Anonymous on Sat, 12/01/2012 - 21:17. Just "upgraded" hah, hah. New machine. New Sonar Version (suckered into it by them offering discount on a plugin extension pack). Won't load video. Won't work properly with video after I'd searched for and got third party drivers. Crashes all the time. I reverted to Sonar X1 still on windows 7 on a much faster PC with more than double the memory. Yet it is HIDEOUSLY SLOW. Posted by Alexander on Mon, 12/03/2012 - 23:27. Try contacting Cakewalk's technical support team, they should be able to better understand the issue and help you with your problem. Goodluck! Posted by FromRealExperience on Mon, 11/12/2012 - 01:13. After using cakewalk software for years I had to finally let go of the hopes that they would create products that worked properly. For well over 5 years, each release was a total nightmare because it's loaded with bugs. There are different ways to set-up the software depending on different machines. A user must trouble shoot problems and get it working on their system. Even after that, there are still too many work-arounds required to use the software. Also, A LOT of bugs exist in every aspect of any area you try to work in, it's really terrible and keeps a person from making progress on music. I do not recommend cakewalk products to anyone looking for a DAW. New releases are really beta-releases. Users may pay for a new version then discover bugs and post them on the cakewalk user forum. This is really poor way to treat customers. After enough bugs are reported on the forum, cakewalk issues patches for the release and after a hotfix (or 2 or 3) then two additional updates, they call it done. This is where they need to be when the customer first buys the software. They can't release quality code because they don't understand what real testing is. Not one of their employees is an actual software tester, they're all developers performing usability testing. Posted by Anonymous on Sat, 04/28/2012 - 00:16. I have win 7 64 bit and cursor stops but playback can still be heard, and the Session switches itself back to Audio (sync) From the Internal mode. Posted by heyrockme on Thu, 06/24/2010 - 22:42. Can I use a USB Mixer? Posted by Anonymous on Wed, 11/25/2009 - 23:35. I was wondering, can I use a USB mixer with Sonar 8 Studio Edition? Posted by Anonymous on Tue, 10/06/2009 - 06:44. Hi guys I have a "yamaha MG166c-usb mixer" but can't indipendantly record tracks in a multitrack ssession, just 1 stream for all the band players...can't edit afterwards. The purpose is to use all 16 tracks for a Live recording thats comming up. Any Suggestions on a specific recording Software that will work that way with my mixer (interface) please let me know. Posted by Anonymous on Tue, 11/10/2009 - 01:17. The USB out is a full mix out, not individual sends. Sorry. Posted by Anonymous on Sat, 11/08/2008 - 23:58. Posted by Stacey on Mon, 11/10/2008 - 00:04. Posted by Will Robinson (via moderator) on Thu, 01/05/2006 - 06:11. I have been trying to convert all my old cakewalk midi files and synced analog tape tracks to Sonar bundled files. After first loading and converting the old cakewalk files to Sonar, I run the tape with time code and record the tape tracks into Sonar. 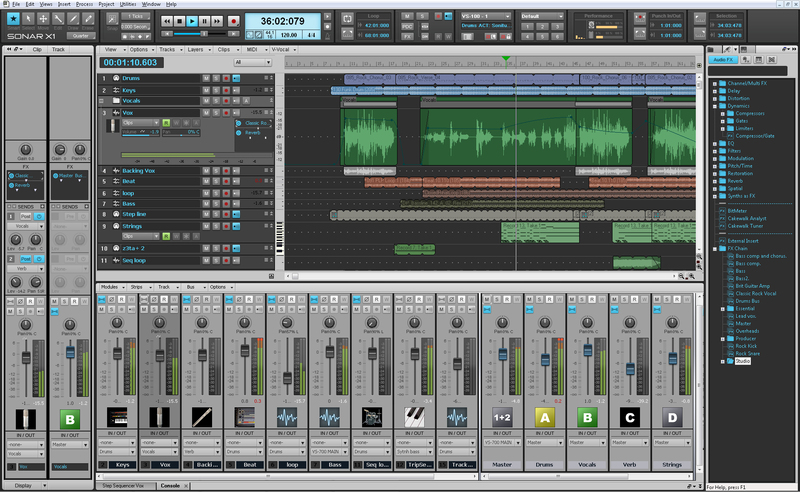 On playback, the audio tracks run faster than the midi tracks. I have some clues to the problem, but haven't found a fix. Any help out there? Posted by Kundan on Mon, 10/23/2006 - 16:12. 2) Different comp with different internal clock speed so use the same comp when u mix down. 4) If none of these above work then try Sonar 2. Posted by James Coleman on Thu, 01/27/2005 - 01:23. Is there any way to make Cakewalk's notation option work with Windows XP ? Posted by P.Konya on Tue, 10/21/2003 - 18:07. I am a solo musician currently using pro audio 8 to play back midi backups. I was told by cakewalk that a foot controller would not work with pro audio 8 but would work with sonar. I just need basic functions (play, stop, loop, etc.) I'm running from my laptop to a roland xv2020 sound module. Has anybody out there done this? Posted by Supe on Thu, 05/29/2003 - 21:22. I am trying to save a file using the demo version of Sonar but the "save" and "save as" option is missing under my "file" window. Any other options? Posted by Anonymous on Wed, 05/30/2012 - 03:55. Can u drag the files onto your computer desktop. Maybe even mix down to one track in cakewalk then drag to desktop. Posted by Stacey on Sun, 01/04/2009 - 12:08. The demo doesn't let you save, you'll have to purchase the software for this function to work! I can't pan audio tracks! Posted by frank on Fri, 10/11/2002 - 05:09. I can't pan audio tracks. I don't know if i'm just doing something wrong or what. full right or left just lowers the valume a little. can anyone help me? Re: I can't pan audio tracks! Posted by Randy on Mon, 01/13/2003 - 02:21. Open console view and click on one of the small buttons above the slider. This allows panning to be manual as apposed to automatic, which seems to be the default. Posted by cameron powers on Mon, 10/17/2011 - 07:33. Posted by Anonymous on Thu, 11/22/2012 - 13:04.
just go to your master and click the stereo button.